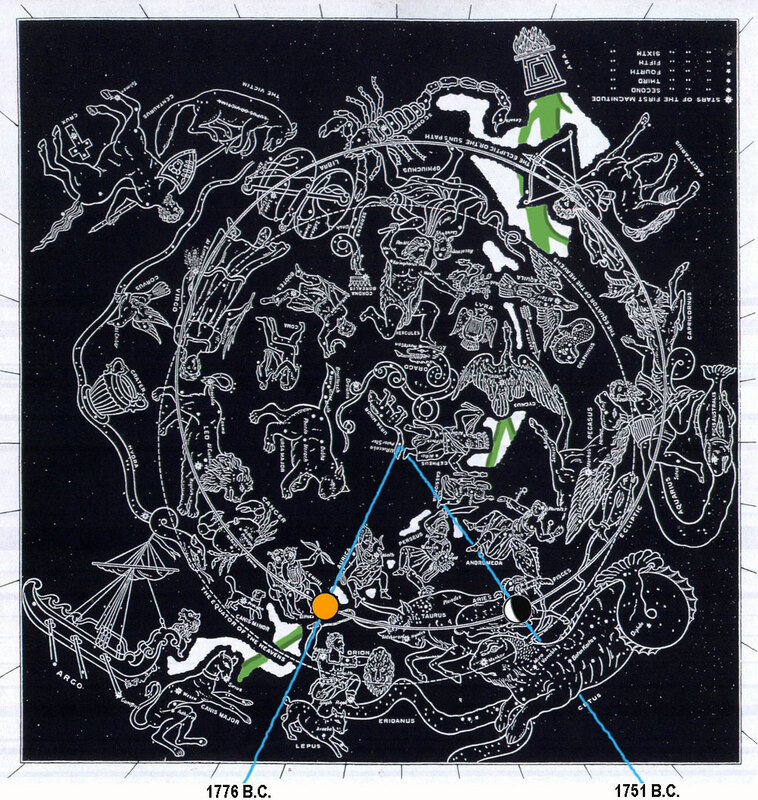 Genesis chapter 26 Star Chart: Clockwise from when "the (Gemini and Orion) Philistines had stopped them (the wells were filled with golden solar sand) after the death of (Pollux) Abraham" (26:18) in 1776 B.C. when (Gemini) Esau and Jacob were 15 years old till "Isaac (Orion) digged again the (lunar) wells of (blue radius) water, which they had digged in the days of Abraham his father" (26:15) and "found (blue radius) water" (26:32), so that Aries sheep and Taurus cattle could drink, and "Esau (Cepheus) was forty years old when he took to wife Judith (Cassiopeia) the daughter of Beeri the Hittite, and Basemath (Andromeda) the daughter of Elon the Hittite" (26:34) in 1751 B.C. is 25 years or 300° months (25 x 12) "Which were a grief of mind (Cetus) unto (Gemini) Isaac and to Rebekah" (26:35). 26:1 And there was a famine in the land, beside the first famine that was in the days of Abraham. And Isaac went unto (Cepheus) Abimelech king of the Philistines unto Gerar. Through Anglo-Saxondom; through the Bible circulated worldwide. 7 And the (Gemini and Orion) men of the place asked him of his wife; and he (Orion) said, She is my sister: for he feared to say, She is my wife; lest, said he, the (Gemini and Orion) men of the place should kill me for Rebekah; because she was fair to look upon. 8 And it came to pass, when he had been there a long time, that (Cepheus) Abimelech king of the Philistines looked out at a (solar or lunar) window, and saw, and, behold, Isaac (Orion) was sporting with Rebekah his wife. 9 And Abimelech (Cepheus) called Isaac, and said, Behold, of a surety she is thy wife; and how saidst thou, She is my sister? And Isaac said unto him, Because I said, Lest I die for her. 10 And Abimelech said, What is this thou hast done unto us? one of the (Gemini or Orion or Auriga) people might lightly have lien with thy (Andromeda) wife, and thou shouldest have brought guiltiness upon us. 11 And Abimelech charged all his (Gemini) people, saying, He that toucheth this man or his wife shall surely be put to death. 14 For he had possession of (Aries) flocks, and possession of (Taurus) herds, and great store of (Gemini) servants: and the Philistines envied him. 15 For all the wells which his father's servants had digged in the days of Abraham his father, the Philistines had (filled with solar golden sand) stopped them, and filled them with (solar) earth. 17 And Isaac departed thence, and pitched his (blue radius) tent in the valley of Gerar, and dwelt there. 18 And Isaac (Orion) digged again the (lunar) wells of water, which they had digged in the days of Abraham his father; for the Philistines had stopped them after the death of Abraham: and he called their names after the names by which his father had called them. 19 And Isaac's (Gemini and Orion) servants digged in the valley, and found there a (lunar) well of (blue radius) springing water. 20 And the (Gemini and Orion) herdmen of Gerar did strive with Isaac's (Gemini and Orion) herdmen, saying, The water is ours: and he called the name of the well Esek; because they strove with him. 21 And they digged another (lunar) well, and strove for that also: and he called the name of it Sitnah. 22 And he removed from thence, and digged another (lunar) well; and for that they strove not: and he called the name of it Rehoboth; and he said, For now the Lord hath made room for us, and we shall be fruitful in the land. 25 And he builded an (solar fire) altar there, and called upon the name of the Lord, and pitched his (blue radius) tent there: and there Isaac's (Gemini and Orion) servants digged a (lunar) well. 30 And he made them a feast, and they did (solar food) eat and (lunar water) drink. 31 And they rose up betimes in the (sun above blue horizon) morning, and (Orion) sware one to another: and Isaac (Orion) sent them away, and they departed from him in peace. 32 And it came to pass the same day, that Isaac's (Gemini) servants came, and told him concerning the (lunar) well which they had digged, and said unto him, We have found (blue radius) water. 35 Which were a grief (Cetus) of mind unto Isaac (Cepheus) and to Rebekah (Cassiopeia). Cf. Genesis 27:46, Genesis 28:8. Isaac and Rebekah regarded a mixed marriage with the people of the land as a source of dishonour to the race; cf. Genesis 24:3. By “a grief of mind” we should understand soreness and disappointment; cf. Proverbs 14:10. The LXX ?ρ?ζουσαι, Lat. offenderant animam, took the meaning to be that Judith and Basemath were quarrelsome, and had given offence to Esau’s parents.